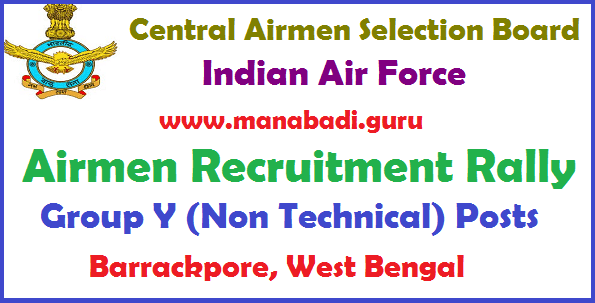 Indian Air Force invites unmarried male candidates from various districts of states of West Bengal & Sikkim to attend Airmen Recruitment Rally at Barrackpore, West Bengal state for the recruitment of Airmen Group Y (Non Technical) posts in Automobile Technician (Auto Tech), Ground Training Instructor (GTI), Indian Air Force (Police) Trades & Medical Assistant.All Eligible and Interested candidates can attend Airmen Recruitment Rally at Barrackpore from 01.06.2017 to 07.06.2017. Candidate should have passed Intermediate/ 10+2/ Equivalent Examination with Physics, Chemistry, Biology and English with a minimum of 50% marks in aggregate and 50% marks in English. Eligible candidates can attend Airmen Recruitment Rally at 4 ASC (Near Palta Gate), Air Force Station Barrackpore, 24 Paragnas (North), West Bengal - 743122 from 01.06.2017 to 07.06.2017. Candidates required to register themselves from 6 AM to 10 AM on same date of rally. Candidates must carry Pencil, Eraser, Sharpener, Gum, Stapler, Blue/ Black pen, 7 recent passport size photographs, 4 sets of attested photocopies and original SSC, Intermediate memorandums, Residence proof, NCC Certificate, Consent from etc. along with them. #All Eligible and Interested candidates can attend Airmen Recruitment Rally at Barrackpore from 01.06.2017 to 07.06.2017.